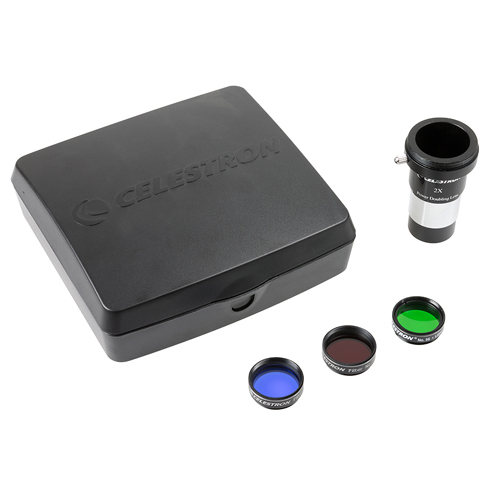 The Celestron Mars Observeing Accessory Kit is designed to enhance the functionality and pleasure of using your telescope. This kit works with many other telescopes that accept 1.25? eyepieces and filters. It features 2x Barlow lens that doubles the power of any 1.25? telescope eyepiece .The Barlow lens has built in t-threads to attach a DSLR camera (t-ring not included) . The Mars Observer Accessory kit also includes #80A filter helps observe Martian polar caps and high clouds , #25 filter brings out detail in maria and polar ice caps , #56 filter assists in viewing dust storms and polar caps.Its accessories are not only great for viewing Mars, they can also be used to observe Jupiter, Saturn, the Moon and many other astronomical objects. These colored filters are anti-reflection coated.